Profile and Blog Updates: Broadcasting of anime episodes. 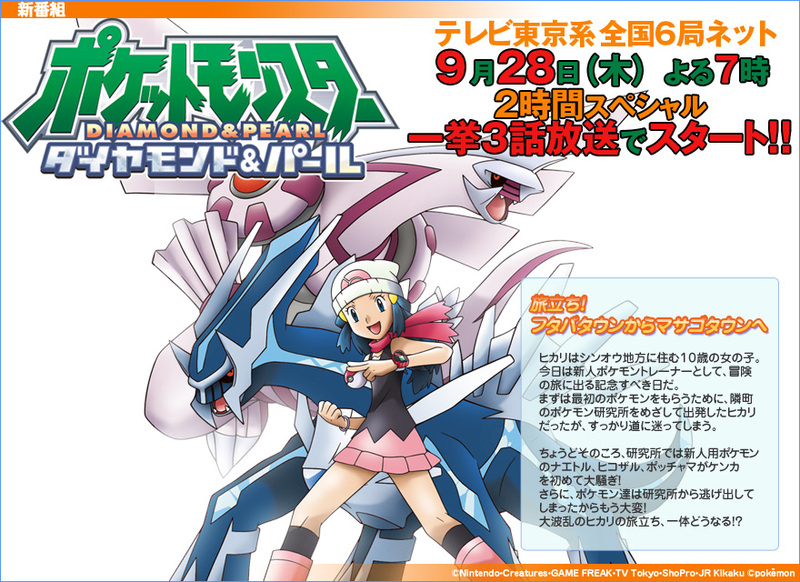 (Pocket Monsters Diamond & Pearl; TV Tokyo will air on its 6 networks nationwide (Japan); Starting on 28 September (Thursday)) Click on image to view the entire thing. Don't you hate it when you heard that the cartoon you like have newer episodes aired elsewhere? Singapore: Airs about half a year after the U.S. release, 1 and a half year after Japanese broadcast. Other countries in Asia (not sure about China and South Korea): Airs earlier episodes. U.S.: In Kanto Region, after battling the 1st frontier brain; Just before meeting Bonsly. I'm not against dubbing but most of the dubbed episodes i have watched (including pokemon season 9 onwards) have awful voices and the timing don't match. Somtimes, the background music (theme songs, background sounds (eg. cars, birds) are removed, reoving the feeling of it. But sometimes when the original background music is played, the music softens or removed when a persorn speaks but doesn't in the origninal version, making it awakward and annoying, in addition to the awful voices and bad timing.